This all-inclusive annual subscription includes the Advance Sheet service, plus any Supreme Court bound volumes and Courts of Appeal bound volumes published within your subscription year. Subscribers also receive a complimentary copy of the Review Granted Opinions Pamphlet. This Pamphlet is published twice a year to facilitate tracking of depublished opinions. 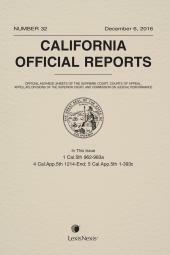 As the one official publisher of the California Official Reports, LexisNexis® editors are part of the court’s publishing process, working closely with the California Reporter of Decisions’ staff to meet all requirements for authenticity, integrity and accuracy. The Advance Sheets are published approximately every 10 days. Two bound volumes for the Supreme Court and ten bound volumes for the Courts of Appeal are anticipated each year. There are usually significant changes to an opinion between release and publication—even changes to cited authority. The Reporter of Decisions’ staff works with LexisNexis exclusively to bring changes to California Official Reports months before other publishers. Don’t miss a vital interpretation! Headnotes and case summaries are reviewed and approved by the authoring justice’s chambers and by the California Reporter of Decisions’ staff. No other publisher offers that. All opinions are checked, corrected and approved prior to publication in the official advance sheet—and again before the bound volumes are published. 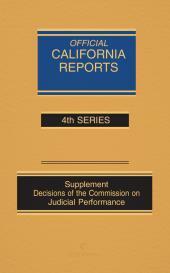 Opinions follow the court’s editing style as defined by the California Style Manual and California Rules of Court.